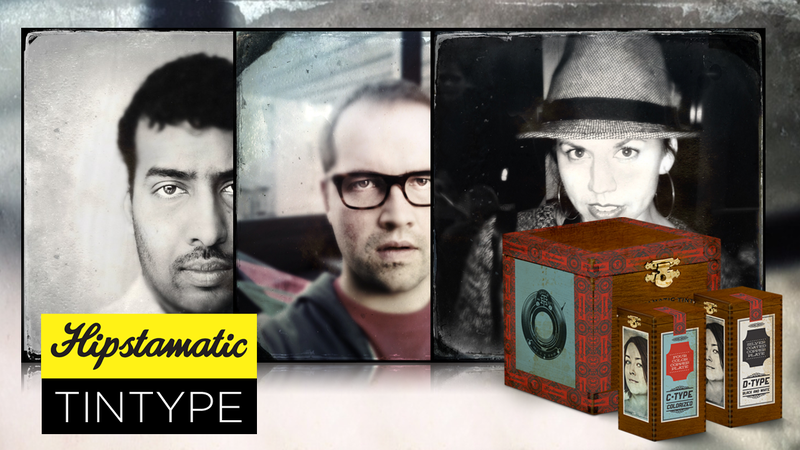 Hipstamatic has released a Tintype SnapPak that takes the retro mobilography fad to a new level of old school. The in-app add-on includes the Tinto 1884 Lens, the D-Type Plate Film and C-Type Plate Film for $0.99. The new lens was created to replicate the shallow depth of field of the metal photographic prints made popular in the 19th century. Hipstamatic co-founder Ryan Dorshorst also shared on the company's blog today that his developers used iOS’s face detection technology to ensure the final look emphasizes a subject's face and eyes. Both films were also inspired by the photographic technology of the 1800s, with the D-Type producing a textured black & white image, and the C-Type creating a hand-painted cyanotype look. Hipstamatic warns the Tintype process will take longer to "develop," and that the latest version of the Hipstamatic app is required to download it. and the results from this new app sure look similar. Very good stuff. Fun to use. They take a little longer to "develop." Perfect new lens and films!! As always!! This is just an ad blurb, more or less taken from hipstamatic's own web page. BTW - just to show how faked this is. Cyanotype is a printing method giving clear blue images. So - how can that C-type *FILM* create a hand painted cyanotype look. Thats just plain nonsense. OK - I can agree that some of the Hipstamatic looks is quite nice and I really like the square format. But the description of the "goods" you can download and buy is just amusing. I wonder who invented the inaccurate texts: Hipstamatic or the "goods" makers? I love the square format! I honestly am not sure you understand what is offering here - you know it's not physical film, right? The term "film" in this use is just the name they use to label software packs, so that digital "film pack" would actually be a set of algorithms that could in fact approximate a blue hand-painted cyanotype. This is the first digital camera filter I've ever seen that I actually may use. The rest of the world of filters have always just looked kind of cheesy to me. I understand how it works. And that they call some kind of algorithms film and some other kind of algorithms lens and also flash - its perfectly fine - actually cute. It would maybe be nice to know whats the difference between a film and a lens. What I dont find OK though is the pseudo photography names and descriptions of the films and lenses. Its just bogus mumbo jumbo. And its a pity, because the result is actually quite nice. No need to make up nonsense names and descriptions. Very clever app. Thanks for your work on the site, despite the haters. Nothing to do with hating. Kind of an odd response for an adult. It doesnt look like a tintype . And it isnt a tintype. Pretty straightforward. It is a clever app (which I don't use), and Dave, I think he was referring to the Connect site haters, not the Hipstamatic haters. I've given it a quick try and it does emphasize the eyes. It may be totally fake, but it is cleverly fake. The look resembles quite a bit the signature portrait look of Belgian cult photographer Stephan (or Stefan) Vanfleteren (who stills works with analog gear, BTW). Google his name, check out his portraits and it will be obvious what I mean. Great comment, it's great to see the work of someone with the actual technique. Yeah ... the tintype images I have seen have been nice. I am not at all against manipulations a la Hipstamatic. Its quite nice actually. My take with it is rather the nonsense descriptions of the diverse filters. That they are called lenses, films and flashes is ... yeah ... quite amusing. But the random inaccurate pseudo technical analogies are just plain wrong. Neither tintype or cyanotype has anything to do with this. And the same goes for almost any of their products. Lots of BS. This looks absolutely nothing like a tintype. More fakery for the unknowing masses.